The area of I-5 and Steilacoom-DuPont road/Exit 119 is one of the busiest in Pierce County. We have been working very hard to improve congestion on I-5 during peak traffic periods, while maintaining access to DuPont, JBLM and neighboring communities. To accomplish this, we will be adding a lane in each direction to I-5 and redesigning the Steilacoom-DuPont Road interchange. But first, we want to hear your opinion on the proposed design alternatives that will address the present day challenges and improve traffic flow in the future. Many of you may already experience daily constrained traffic flow at this complicated area, in which ramp intersections, JBLM's DuPont Gate, the railroad line, and the intersection of Wilmington Drive and Barksdale Avenue converge. 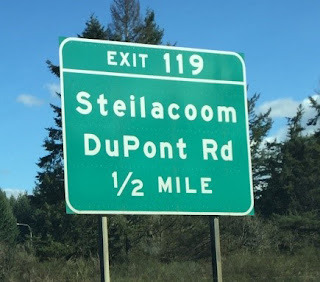 In addition, the bridge that now spans I-5 at Steilacoom-DuPont Road was built in 1957 and the locations of its piers do not accommodate more lanes on I-5. We are proposing to rebuild that overpass and improve it in the process not only by widening it but also by increasing its vertical height over I-5 to meet current standards. 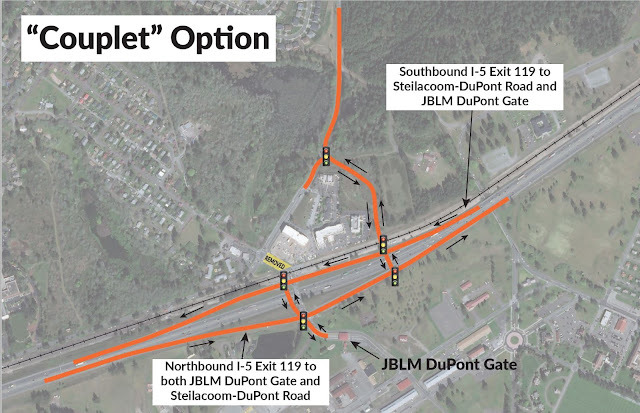 The new bridge would provide access to JBLM's DuPont Gate. The existing at-grade crossing of the railroad track would be removed. Approximately 900 feet to the north of the existing overpass, we are also proposing to build a second elevated overpass that would serve travelers using Steilacoom-DuPont Road. This overpass would be built over the railroad. 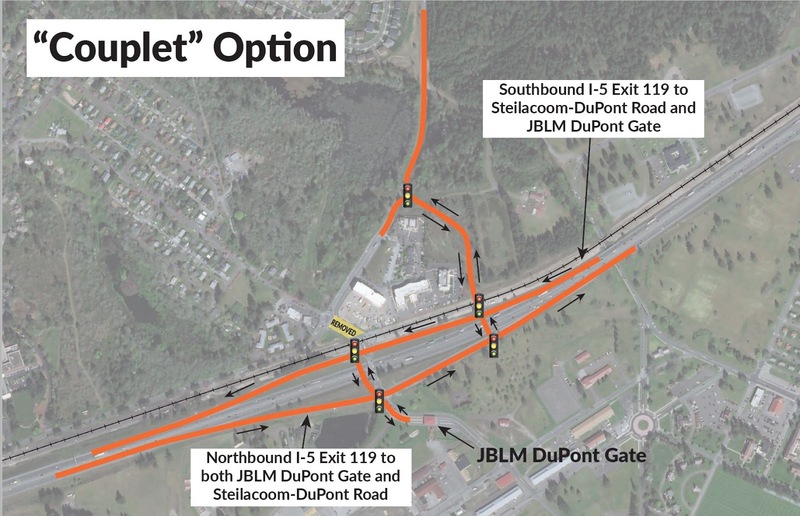 In the "Couplet" option, drivers would access both the JBLM DuPont Gate and access to Steilacoom DuPont Road on the same ramp. In the "Bypass Ramps" option, drivers going to the JBLM DuPont Gate would be on a separate ramp. 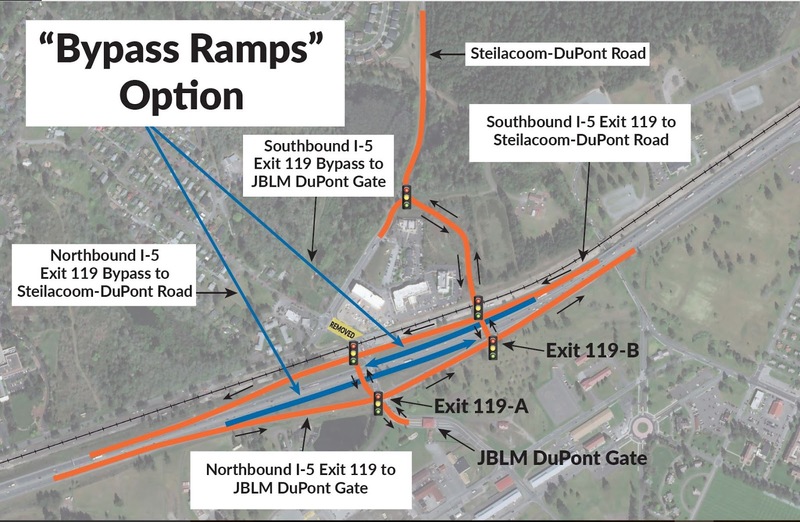 Drivers going to Steilacoom-DuPont Road would bypass this ramp. Which option would you prefer and why? Please join us at our April 11 Open House at Pioneer Middle School at 1750 Bob's Hollow Lane in DuPont from 4:30 to 7:30 p.m. and give us your feedback. My colleagues and I are looking forward to answering your questions and listening to your comments. If you can't attend, you can email us your feedback and questions. Do you have funding for this project? This work is part of the $495 million I-5 Mounts Road to Thorne Lane Interchange – Corridor Improvements project, funded by the 2015 Connecting Washington transportation package. So glad I got a job in Lacey. Goodbye I-5!! Expected completion should be 2021 for this phase? There also needs to be an adjustment to the merge lane from 118 to northbound I-5. Since the latest change there have been dozens of accidents. The current overpass bridge is far too narrow. Traffic constantly backs up into intersections on both sides of I-5. The bridge should have been expanded and also extandended over the train tracks. It would also help if JBLM moved the Dupont gate further into JBLm and increased the number of inbound/outbound lanes.